A wonderful spectacle, and an uplifting way to remember loved ones. 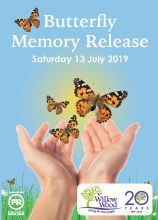 A very touching way to remember loved ones is to take part in Willow Wood’s Butterfly Memory Release, on Saturday 13 July. Every life remembered is represented by a beautiful living butterfly, which will take flight from your hands into the landscaped gardens at the Hospice. It is a wonderful spectacle as they open their wings and lift into the air, before coming to rest on the flowers, many of which have been planted to provide food for the butterflies. It’s quite poignant later in the year to see butterflies flitting in the gardens, and to wonder if they are descended from one you have released in memory of a special person. Butterfly Memories is such a popular event that there will be three releases during the afternoon, at 12noon, 1.30pm and 3pm, all of which follow a short blessing by Hospice chaplain Eddy Inglis. The Butterfly Memory Release is open to everyone, whether touched by our care or not. We do ask for a minimum donation of £15 per butterfly and you can make your dedication online now, easily, quickly and securely.